You don’t have to be limited to just one color when coding. Your parts can be a magical unicorn forest where colors change every second or loop through the colors of your favorite superhero! Create a new part with a descriptive name like LoopingPart, or RainbowPart. This lesson will use LoopingPart. Create a new script under ServerScriptService. Encourage students to write comments in their own words. Offer feedback to ensure comments are clear and specific. Needs improvement: Changes the brick. Specific: Changes color of Looping part every 5 seconds. Not only can variables hold strings, they can also hold directions to an object. Typing game.Workspace.NameOfYourPart over and over is pretty boring. To save time, that entire line can be stored inside a local variable. Under your first comment create a local variable named loopingPart by typing local loopingPart. Set your variable to the location of the part’s BrickColor property by typing local loopingPart = game.Workspace.loopingPart. In coding, the = sign doesn't have the same meaning as it does in math. It doesn't mean that things are equal. Instead, it changes the value of a variable. 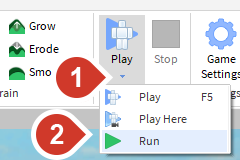 Roblox developers have rules when naming parts and variables to help them know what's a variable and what's a part. The code you made before ran once and then stopped. To make your code repeat use a while true do loop. Loops repeat until something tells them to stop. We’re not going to tell the code to stop, it’ll run forever! Write a new comment describing what you are about to code. For example: Looping code. On the next line type while true do. Press Enter on the keyboard. The word end should autocomplete for you. You might have noticed the editor automatically added end to the script and indented the next line of code. Indenting makes code easier to read. Everything between while true do and end will loop forever. Inside the loop, type code to change the part’s BrickColor property to a new set of RGB values. If you run the script now, you'll get an error that may say "A script has been running for a long time, and may be hanging." If you encounter this error, press "Kill Script". The script is trying to run the color change non-stop and needs something to slow it down. To create a new color remember to: Use 3 decimal numbers between 0 and 1. One each for red, green, and blue, each separated by commas. In order for code to run in the loop, it has to be between the while true do and before end. Having your code in the right place so that it runs correctly is referred to as being in scope. -- Code here is inside scope. That means it'll run forever. -- Code here is outside the loop's scope and won't repeat. If you add a second line of color changing code right now, it would change the brick’s color so fast you might not even see the first color go by. To make the script wait before running the next line of code, use a wait() function. Functions are pre-programmed chunks of code. Rather than having to type all that code out again, coders create functions as shortcuts. Coders really like shortcuts. Hello World used a print() function. Add a wait function to make the code wait 3 seconds. On the line after the BrickColor changing code, type wait(3). wait() takes a number variable type instead of a string variable. Number variable types hold only numbers and do not use quotation marks. You have one color, now you need a second color for your code to switch back and forth between. Under the wait function, set loopingPart.BrickColor to a new color. Add a second wait function. If you don’t, the second color will blink so fast you won’t see it. Continue adding colors and wait functions until you have as many colors as you want. Make sure you have a wait function between each color change, especially at the last line. Make sure any code that you want to loop is between while true do and end. Make sure all RGB values have numbers from 0 to 1, are decimals, and are separated by commas.